When starting Nanowasp I get "Configuration Error: Unable to open ROM file". 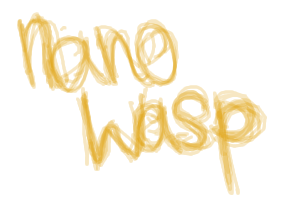 Nanowasp only emulates the Microbee hardware, and so requires original Microbee software to do anything useful. At a minimum you will require the boot ROM (Data\rom1.bin), the character ROM (Data\charrom.bin), and a boot disk (Data\boot.dsk). See Getting Started for details. The screen appears to be blurry. Ensure you have Antialiasing set to "Application Controlled" in your OpenGL driver configuration. I can't type a double quote! Download the Microbee ROMs and operating system for the 128k disk system. A zip file containing these can be found here. Download a disk image containing Microbee software you wish to run. Disk images can be found here. For the moment download sample.zip which contains a few games. Unpack the OS files and the sample disk image into the Data folder in your Nanowasp installation. The Data folder should now contain the files rom1.bin, charrom.bin, boot.dsk, and sample.dsk. Run Nanowasp from your Start menu. It should boot and present the shell screen (check the screenshots to see what it should look like). Note that the emulation tries to be true to the original speed of the machine so it may take a few seconds to boot up. Load the sample disk into drive B by selecting menu Microbee - Load Disk B... and choosing sample.dsk from the Data folder. When the emulator starts it automatically loads the disk Data\boot.dsk into drive A in order to boot, but drive B is empty. Press '3' or type basic and press enter to start up MicroWorld Basic. Basic will take a little while to load (the emulator doesn't have a disk activity indicator yet). Once Basic has started, run Emu Joust by typing runm "b:emujoust.mac" and pressing enter. Follow the instruction on screen to play! To return to the shell, reset the Microbee by selecting menu Microbee - Reset (this was standard for exiting many games on the Microbee). The floppy disk controller emulation doesn't emulate the Write Track command correctly, which means the Microbee utility init.com is unable to perform its format function. A bug in the emulation of the Z80 CPU causes the random number generation routine of some programs to fail (notably all the enemy jousters in Emu Joust spawn from a single point). Certain timings aren't emulated correctly, resulting in some programs running too fast in some situations. The Z80 PIO is not yet emulated at all (this device provides the interface to the sound, tape, and serial port circuits).